Lord help me, I read the comments… | Musings of a marginally sane feline-appreciating female. ← Grace Hopper Documentary comes out today! I know, I know – never read the comments on the internet. Our local radio news station just posted an article on Facebook about someone who used to live here and is now wanted by the FBI on terrorism charges. He used to be a taxi driver. Even though the poster that goes with the article states that he is believed to have left the country 2 1/2 years ago, I understand why they would post it – perhaps someone in the area may know where he is. I made the grievous error of reading the Facebook comments… I feel I should make it clear – these are not my friends – these are just people who responded to WTOP’s post. I guess no one has told Robert that King Barry passed away last fall. I don’t even know what Richard is talking about. I wonder what Alan thinks of Ron White’s “Tater Salad” alias. Mike is still trying to explain to his parents what an UBER brand ambassador does. I’m guessing Joe also doesn’t understand why people protest, either. David must be fun at parties. 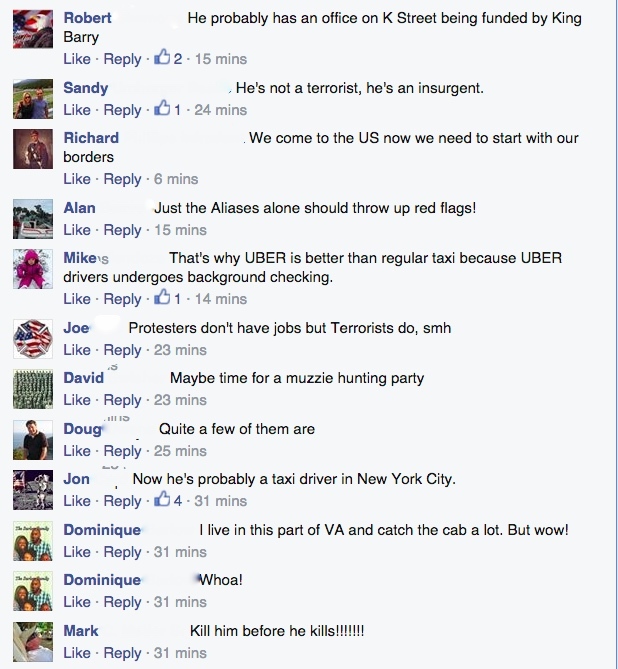 I’m not sure if Doug means that taxi drivers are terrorists, or terrorists are taxi drivers. Neither Jon nor Dominique seem to have caught the “left the country” part. In 6 months, I think we’ll hear about Mark shooting himself in the foot while cleaning his gun. This entry was posted in Miscellany, News and tagged How to find the racists, Internet Comments, local radio news, News. Bookmark the permalink. Oh come on. You know you can’t look away. It’s comment train wreck. They’re just *so* awful. And it’s not like they’re posting under pseudonyms – they’re using their real names and putting this stuff out there publicly – and they’re not the slightest bit embarrassed.